"ONE OF THE BEST SPARKLING WINES WE'VE HAD ALL YEAR." Blended to be fun and delicious regardless of glassware or setting. OREGONICALLY GROWN®. 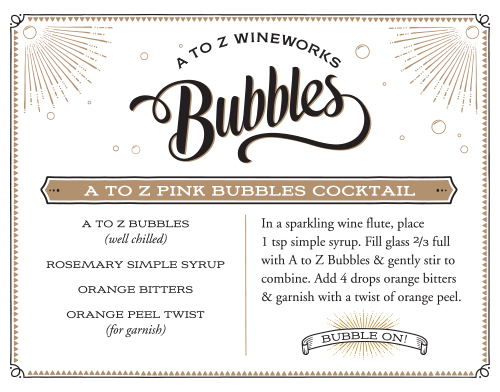 The lovely, pale pink A to Z Bubbles invite with juicy, ripe fruit aromas. Notes of strawberry, raspberry, watermelon, cherry, white peach, nectarine and apricot are joined by white flowers and a hint of creaminess. The bubbles dance on the tongue with mouth-watering acidity that leaves one wanting more. Primarily Pinot Noir with a bit of Chardonnay (10%), the fruit was left in contact with the skins to get the perfect color, a traditional, natural technique preferable to blending back red wine. 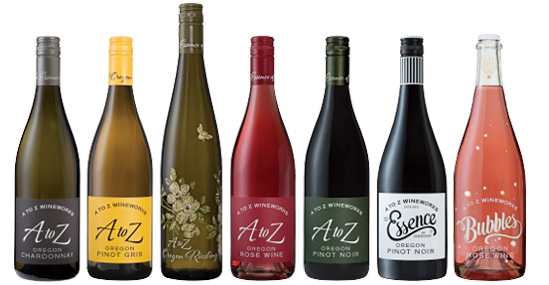 Several different aromatic and Rosé yeasts were used during fermentation in 100% stainless steel for freshness.